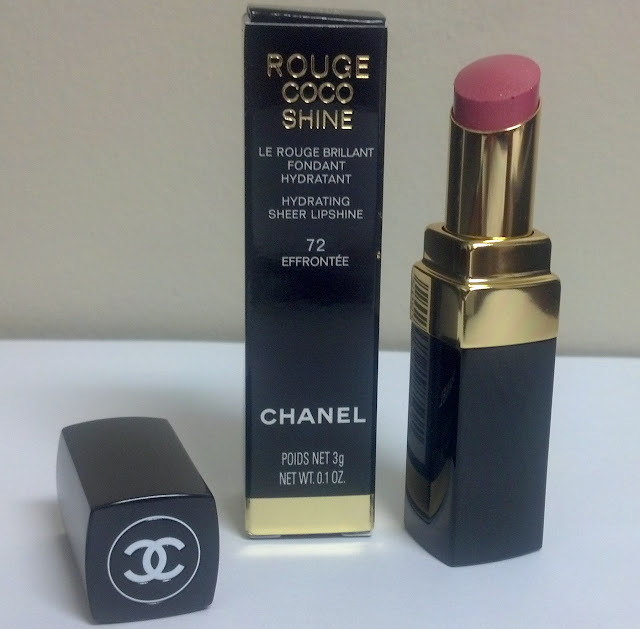 CHANEL ROUGE COCO SHINE Hydrating Sheer LipShine: #72 EFFRONTEE ($32.50 USD) is described as a soft sensual rosewood pink lipstick. 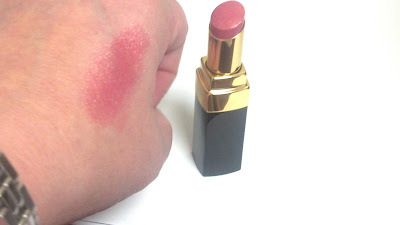 It does contain small flecks of sparkle that are visible in the tube and on the lips but its in such a way that it enhances the overall shine of the lipstick on the lips. This rouge coco shine is one of six new lipsticks to tentatively be added to Chanel's permanent line. You can read my earlier post about all of the new lip products here. I really love the rouge coco shines because they go on smooth like a gloss, they don't taste icky like most lipsticks, and they deposit just enough color to my lips that it lasts a good portion of the day. I'm also still considering purchasing #70 Sourire rouge coco shine which is a vibrant intense pink but I haven't decided yet. I'm thinking it might be too bright for me but I'm going to check them all out again later today so I'll let you know what I decide. Anyway, even though I may or may not purchase the other rouge coco shines or any of the rouge coco lipsticks, I will try to post swatches of them all if I have the time. ROUGE COCO SHINE makes an irresistible desire for lightness flit over your makeup. With its mischievous touch, it glides over lips with all the charm and freshness of a snapshot. As melt-away as a balm, its lip-embracing texture becomes fluid on contact with the lips and provides a stunning wet effect with natural shine. Deliciously fresh and tender, it delivers an unforgettable sensation of well-being. Lips are enveloped in the incomparable comfort of continuous 8-hour-long hydration thanks to the Hydratender complex, the secret of softness of the ROUGE COCO range. Sparkling with vitality, your smile takes on sheer colour, from candid beige to tangy red. ROUGE COCO SHINE comes in 18 shades infused with luminosity so that your smile adapts to every emotion and desire of each day. From her first successes to magical encounters, their names tell the story of Coco Chanel at the dawn of her destiny. Collect colours to your heart’s desire! I love this shade and purchased it on a cruise ship last December. However I fear I am going through it too quickly and it is so much more expensive in the shops here in Australia, so am sending ambassadors out to buy it for me when they visit overseas. It really is a great product, as you say.